Forty years ago, the hockey world fundamentally was changed by the start of an eight-game series between national teams from Canada, loaded with NHL players in their prime, and the Soviet Union -- considered the two best hockey-playing nations in the world at the time -- that played out across the month of September. The series was a must-follow for hockey fans across the globe and after its dramatic conclusion --- a 4-3-1 series win for the Canadians -- there was no question that the NHL never would be the same again. This month, NHL.com looks at the historic Summit Series with a month-long collection of content. When a team is in the kind of hole Canada was entering Game 6 of the Summit Series -- down 3-1-1 and facing three more games in a hostile building -- it's sometimes best to look at the little picture, rather than the big one. That's what coach Harry Sinden did at practice, encouraging his players to think about the next shift and the next period, rather than the entirety of the task at hand. He also changed strategies, getting away from the straight-line tactics that were common in the NHL and pushing the tempo with head-man passes and criss-crosses to take advantage of the Soviets' biggest weakness: their play in their own zone. The Canadian players were also starting to round into shape as they took the ice on Sept. 24, 1972 -- and they were becoming more familiar with the Soviets' tactics, which were unlike anything they had seen in the NHL. Canada left the ice after Game 6 with a 3-2 victory that gave them renewed confidence and kept alive their hopes of winning the 1972 Summit Series. Second Period: 1, USSR, Liapkin 1 (Yakushev, Shadrin), 1:12. 2, Canada, Hull 2 (Gilbert), 5:13. 3, Canada, Cournoyer 2 (Berenson), 6:21. 4, Canada, Henderson 5, 6:36. 5, USSR, Yakushev 3 (Shadrin, Liapkin), 17:11 (pp). "It caused us, and especially our goaltenders, a lot of problems early," Bob Clarke told NHL.com when asked about the Soviets' style of play. "They would pass from areas where we would always shoot. That led to a lot of confusion with our goalies and with our team. Also, our conditioning was poor. But once we got into shape and were at the same level of physical conditioning as them, we were able to handle it. And once we got into the same condition as them and had some games under our belt, they couldn't handle us." The specter of having to return to Canada after losing to a team they were expected to rout provided some additional incentive. "Fear is a wonderful motivator," Paul Henderson told NHL.com. "After we lost the first game [in Moscow], I said to my wife, 'If we don’t win the last three games, we're going to be known as losers for the rest of our lives. We have got to win the last three games.'" In addition to dealing with Canada on the ice, the Soviet authorities were trying to figure out how to tamp down the enthusiasm of the 3,000 Canadian fans that had made the trip to Moscow. The noise and behavior of the visiting fans was such that Soviet authorities broke up the visitors' section and scattered the fans around the building. All that succeeded in doing was getting the red-clad visiting fans to cheer louder. Their cheers in the first period were for goaltender Ken Dryden, who hadn't expected to play for the rest of the series but got the start after the Soviets' five-goal barrage against Tony Esposito in the third period of Game 5. Dryden stopped all 12 shots he faced in the opening 20 minutes as the Canadians killed off three power plays called by the West German officiating crew of Franz Baader and Josef Kompalla. 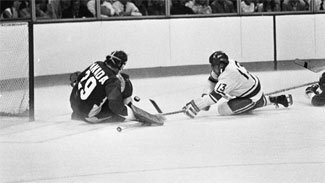 Yuri Liapkin fired a slap shot through a screen and past Dryden 1:12 into the second period to put the Soviets ahead, but Canada retaliated with three goals in a span of 83 seconds. Dennis Hull flipped the rebound of Rod Gilbert's shot over Viacheslav Tretiak at 5:13. Red Berenson hit Yvan Cournoyer in the slot for a blast that found the net at 6:31, and Henderson intercepted a pass, split the defense and blasted a slapper past a surprised Tretiak 15 seconds later for a 3-1 lead. In a game and a series that was becoming increasingly nasty, Soviet star Valeri Kharlamov had become a marked man. Clarke drew a minor and a misconduct after a scrum with Kharlamov; after serving his penalties, he returned to the ice and slashed the Soviet star in the ankle -- which remarkably went unpenalized, though Hull was called for a mysterious slashing call seconds later, at 17:02. Alexander Yakushev, another Soviet player who was making a major impression on the NHL, got one back by scoring a power-play goal nine seconds after Hull was penalized. But Canada's penalty-killing was flawless the rest of the way, shutting down the Soviets during a high-sticking major to Esposito late in the period that turned into a two-man advantage for 2:00 when Canada was given a bench minor for protesting the call -- Sinden and assistant coach John Ferguson were so irate that Berenson had to calm them down. The Canadians completely stifled the Soviets in the third period, killed off a final power play when Ron Ellis was called for holding with 2:21 left in regulation, and left the ice with a 3-2 victory that gave them renewed confidence and kept alive their hopes of winning the series. "The most important thing was the psychological power that derived from not wanting to be what my brother called 'a bunch of bums' and 'a disgrace to my country,'" Gilbert said. "We didn't want to lose. We couldn't have come back to Canada."